In the last couple of days the EURUSD has enjoyed rock solid support from the key 1.13 level and has surged higher back towards the other current key level of 1.15. In the last couple of weeks the EURUSD dropped from a three month high near 1.1570 and returned back below the key 1.15 level. For the last couple of months now the EURUSD has been content to trade within a narrow range enjoying support from 1.13 and meeting resistance at the 1.15 level. It is interesting to note that its recent excursion above 1.15 didn’t last long as it was quickly sold down at those three month highs. The 1.13 level has also become quite significant of late, and even though it has fallen through this level a few times, it was quickly pushed higher through strong buying which will provide some confidence that the 1.13 level will provide strong support should the EURUSD attempt to decline again. After dropping through the 1.13 level near mid-November, the EURUSD did well to rally higher from its lowest levels in 16 months back up towards 1.15 before easing in the week afterwards. Likewise the 1.15 level has become key of late providing stiff resistance and looming above ready to push prices lower. Towards the end of October the EURUSD did well to surge higher off support at the key 1.13 level after having fallen strongly over the last few weeks from above 1.16. Only several weeks earlier the EURUSD fell strongly from multi month highs above 1.18 down to the key support level at 1.15. 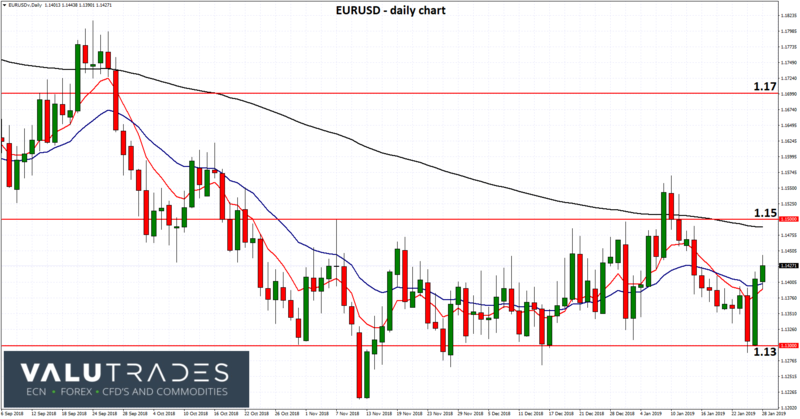 In the second half of August the EURUSD rallied strongly as it recovered from a 12 month low at 1.13. In early June the EURUSD rallied well and moved back above 1.18 before it experienced a sharp drop down to a near 12 month low just above 1.15. The President of the European Central Bank (ECB) Mario Draghi has again warned that euro zone's (EZ) economy is weakening more than expected, has performed worse than expected in recent months and still needs "significant" support from the ECB. "Over the past few months, incoming information has continued to be weaker than expected on account of softer external demand and some country and sector-specific factors," Draghi told the European Parliament's committee on economic affairs in Brussels. "The persistence of uncertainties in particular relating to geopolitical factors and the threat of protectionism is weighing on economic sentiment," Draghi added. "Significant monetary policy stimulus remains essential to support the further build-up of domestic price pressures and headline inflation developments over the medium term," Draghi added. "The Governing Council stands ready to adjust all of its instruments, as appropriate." The markets have pushed back their expectations for when the ECB will raise rates for the first time since 2011, to around mid-2020 at the earliest, well after Draghi leaves office in October.